Melissa Carl (SFGI07) worked in academia for years before becoming a car mechanic. 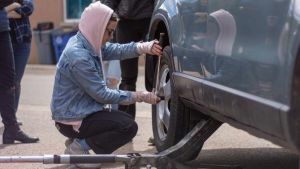 Now, she has written a book about her experience called Becoming Hephaestus: Finding Philosophy in Car Repair, due out in 2020. 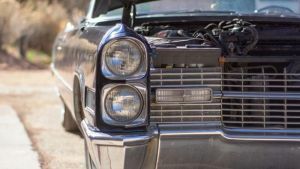 After years spent working in academia and as a scientist, Melissa Carl (SFGI07) realized she was lacking in “real-world practical experience.” She couldn’t fix a blown fuse, she admits, much less figure out what to do when her car wouldn’t start. 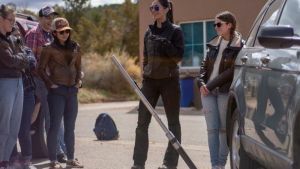 Carl considered a few ways to establish a more pragmatic skillset before deciding she’d take a class on car mechanics at Santa Fe Community College. Carl, who worked as a teacher at a local prep school, took a few mechanics classes over the summer and continued into the school year. 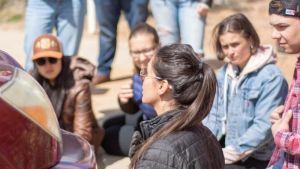 She had long been frustrated by the “subjectivity” of the educational system, and after a year, she knew she was ready to make a change. “At the end of the day, there was nothing that I could point to and say ‘I did that,’” she explains. “When you’re an educator, the fruits of your labors become proxied. Anything you did well ultimately stood at a distance. You teach an excellent lesson and then the students take the exam. If the students do well, the success is the students.’ Whereas if the students do poorly, that failure becomes the teacher’s responsibility. It was an economy I found increasingly frustrating, and I realized it was not a battle I was going to win. 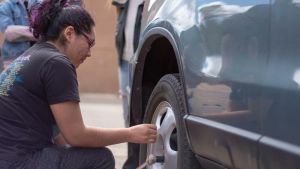 A little over a year after she had taken her first class at the Community College, Carl was hired as a mechanic at Amigo Tire & Auto. 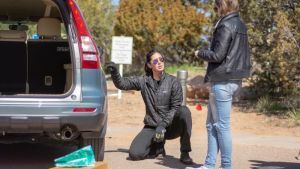 Many in her field have grown up working on cars, but qualification actually comes down to a standardized test from the Automotive Service Excellence (ASE) certification group, which she passed. At Amigo, she does tire, suspension, brake, and other “under-the-vehicle” work, as well as alignments and the occasional under-hood project. The work, Carl says, is “the most physically demanding” of any she has done, but she appreciates its honesty (and her “patient, helpful, supportive” coworkers). 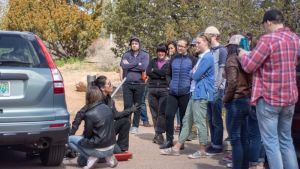 She recently held a similar workshop for Johnnies on the Santa Fe campus, electing to bring a Program-focused approach. 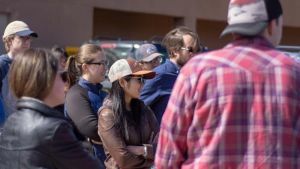 Over the course of the workshop, Carl covered how to look at tires and determine their proper inflation, how to safely lift a car using a floor jack, and how to use a cross to remove lug nuts. The clinic was a success; many students attended, and one student even secured an internship with Carl at Amigo Tire & Auto. It’s not surprising, though, that Johnnies took to the work—after all, it was the Johnnie mode of thinking that spurred Carl to switch careers in the first place. 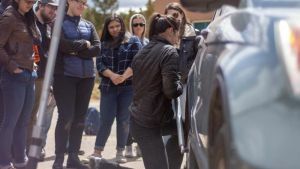 Melissa Carl (SFGI07) recently led a clinic on car basics for Johnnies on the Santa Fe campus. Photos by Keith Greenfield.